The weather was beautiful for the Oyster Run. This is something to really see and take part in. Every year in September motorcycles from all over the northwest and Canada converge on Anacortes, Washington. 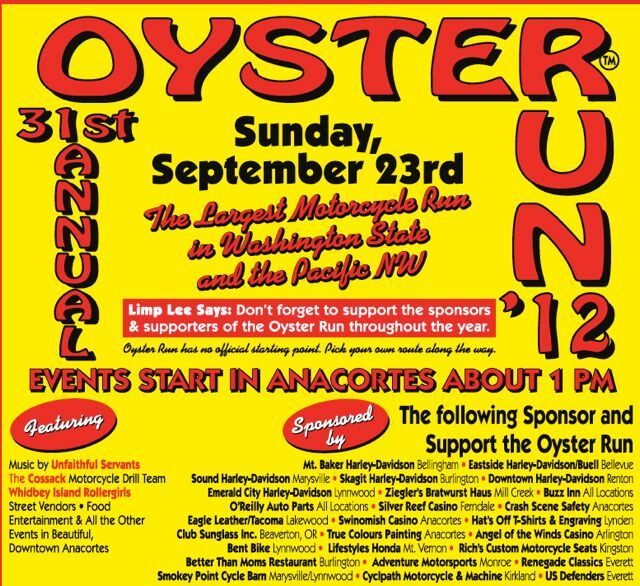 To find out about the Oyster Run and its history go to their web page http://www.oysterrun.org/ I have to tell you that the Oyster Run Committee does an outstanding job. They are well organized every year and it shows in how well this event runs. Thank you for doing such a great job. You have to thank the city of Anacortes and all the businesses that support this big undertaking. Lots to see, eat and drink. I was up early so the photos I took are in order. In the beginning there are very few bikes anywhere and it builds from there. Saturday night you could hear 3 bands playing at the same time. I think everybody had a great time. Monday morning in Anacortes you could see bikes still in town. Put it on your bike calendar for next year.